Explain and comment on the main reforms made to the civil justice system after the Woolf Report. 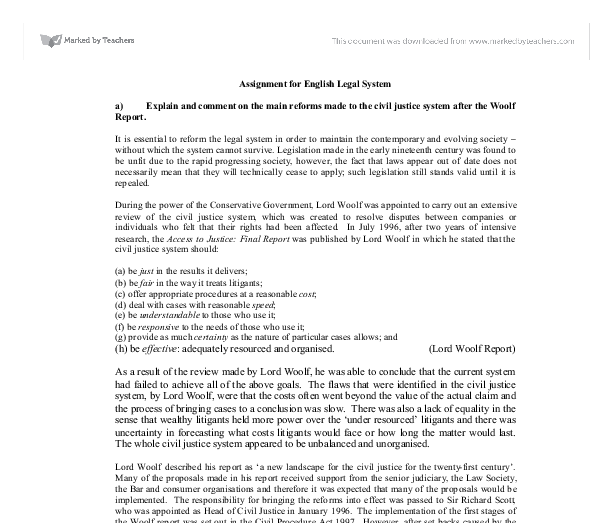 Assignment for English Legal System a) Explain and comment on the main reforms made to the civil justice system after the Woolf Report. It is essential to reform the legal system in order to maintain the contemporary and evolving society - without which the system cannot survive. Legislation made in the early nineteenth century was found to be unfit due to the rapid progressing society, however, the fact that laws appear out of date does not necessarily mean that they will technically cease to apply; such legislation still stands valid until it is repealed. During the power of the Conservative Government, Lord Woolf was appointed to carry out an extensive review of the civil justice system, which was created to resolve disputes between companies or individuals who felt that their rights had been affected. In July 1996, after two years of intensive research, the Access to Justice: Final Report was published by Lord Woolf in which he stated that the civil justice system should: (a) be just in the results it delivers; (b) be fair in the way it treats litigants; (c) offer appropriate procedures at a reasonable cost; (d) ...read more. They felt that they were not able to litigate cases cost effectively, as the reform had intended, due to the lack of assistance within the administration of the courts, such as not being able to obtain urgent orders or contact them over the telephone. Overall, the developments made to the civil justice system subsequent to the Woolf report have proven to be predominantly effective. Quickfix Ltd has separate contracts with two companies, Roughs Ltd and Stokes Ltd, to purchase goods. Roughs have failed to deliver some of the goods and it has cost Quickfix �10,000 extra to replace these items and they wish to claim the �10,000 from Roughs. Stokes has delivered faulty goods and Quickfix wish to claim �80,000 from them. (b) Advise Quickfix on the type of court and procedure likely to be used for each of their claims In light of the facts, I would fiirst of all advise you to attempt to resolve matters by communicating with both companies. If this proves unsuccessful then correspond with both companies notifying them of your intention to take matters to court unless they respond within 7 days. On assumption that both companies have not responded to your notification, you may then proceed with the matter to court. ...read more. After this stage, a pre-trial review will be held. The purpose of this is to determine a timetable for trial, arrange who will give evidence and in what order, the content of the bundle and a deadline for it to reach the court and finally the time allowed for trial. The fast track cases are usually dealt within one day lasting a maximum of 5 hours. After the trial has ended the court will send both you and the defendant with an order (judgement). This will have a detailed decision made by the judge together with any order of costs. If the judgement orders Roughs Ltd to pay the full amount of �10,000 plus costs but they refuse to pay then you must ensure that you enforce your judgement by notfiying the courts, as they will not take action unless told to. However, there will be a fee payable to court for this enforcement. 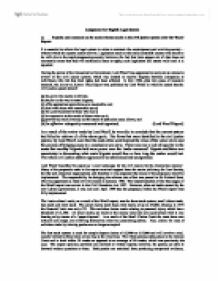 In respect of the second claim the procedure will more or less be the same, however, as this claim is more than �50,000, it will be dealt by the High Court through the multi-track process. The High Court may decide to refer the matter to the County Court as it is relatively straight forward and holds no issues of public concern and it will be dealt with more quickly. ...read more. This student written piece of work is one of many that can be found in our AS and A Level Machinery of Justice section. The emphasis of the new rules is on avoiding litigation through pre-trial settlements. Litigation is to be viewed as a last resort, with the court having a continuing obligation to encourage settlement. In order to address the issue of complexity there has been an attempt to write the new rules in plain English, replacing old-fashioned terminology with more accessible terms. Recommendations of the Woolf Report 1996. There were other issues involved as well But Lord Woolf felt that some changes need to be made.So on the 25th of april 1999 the new civil procedure rules were in place, and aimed to deal with all cases justly. if it is in the interests of justice to do so. 3) Eligibility There will continue to be both merit and means tests in civil cases with contributions being payable where appropriate. There is unlikely to be major changes in the means tests until greater funds are available (these though will have to come from savings within the scheme). What tends to happen is that parties feel they have finally had a chance to "tell their story"." Also, the parties and their lawyers are aware that an experienced and independent neutral, having heard all aspects of the case, has arrived at a conclusion that likely will be mirrored by a trial judge or a jury. The CPS. This was established by the Prosecution of Offences Act 1995. The CPS is organised as there being a Director of Public Prosecutions and he is accountable to the Attorney General. There have also been developments in the fields of forensic engineering and forensic accounting which have increased the use of expert witnesses in civil cases as well. As the use of expert witnesses has increased, so has the attention that the media has given to their comments.